"If you've seen Collateral, you've seen Killer"
"Its a total rip off of collateral not a skeleton. Its better to avoid tis movie, and go to a video library and buy Collateral." "Killer was inspired by Collateral"
"The Killer: An okay Collateral copy"
"Achi movie hai pori time hai copied hai per nice copy !! " "What! The writer has described the entire Collateral movie and she says it is not a copy!!!" "The Killer is a copy of Collateral"
This is how reviews and comments about the movie is posted on the Internet! 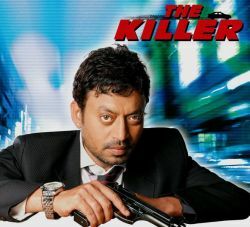 The Killer has Irfaan Khan playing Vikram, a ruthless, well suited-booted killer, who hardly bats an eyelid while pulling the trigger. One fateful night, while Vikram is on a mission to bump off a number of people, he takes a cab. The driver of this cab happens to be Nikhil (Emraan Hashmi). Now, Nikhil is a righteous guy who earns his living the hard way, toiling round the clock to make ends meet and to save enough to ensure a secure future for himself and his girlfriend Rhea (Nisha Kothari). The semblance of normalcy fades away a few moments after Vikram steps into Nikhils cab. Nikhil soon finds himself involved in a nightmare from which he can't wake up. As Vikram begins his night of killing, Nikhil is taken along as an unwilling accomplice. While Vikram constantly threatens Nikhil, he also saves his life when danger comes. Nikhils patience begins to wear off as Vikram goes about gunning down people. But when Nikhil comes to know that his girlfriend is one of the targets, he decides to take on the killer. In the end Nikhil is able to kill Vikram and save his girlfriend.